This is the first of what will (hopefully) be many posts in which we cook and eat the food featured in our favorite books. Recipe/book suggestions welcome! We have established that I’m a book nerd. Also: I occasionally like to eat things. You, too? So, it only makes sense that we should combine our love of books and food in this, the first meeting of the Literary Nibble Club. Club is now in session! 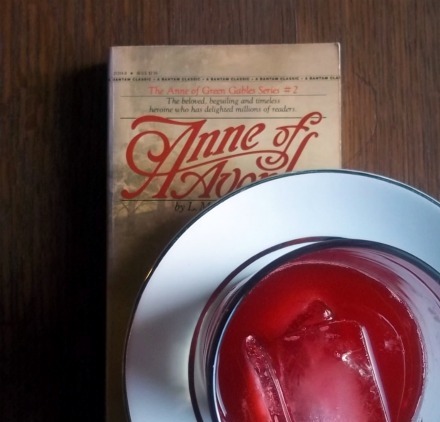 Let’s bring this meeting to order by addressing the awesome that is Anne Shirley and Diana Berry’s raspberry cordial adventure. If you’ve never read Anne of Green Gables 1) I don’t know if we can be friends 2) you don’t know that Anne accidentally got her BFF Diana quite drunk on wine they mistook for this raspberry cordial. 1. 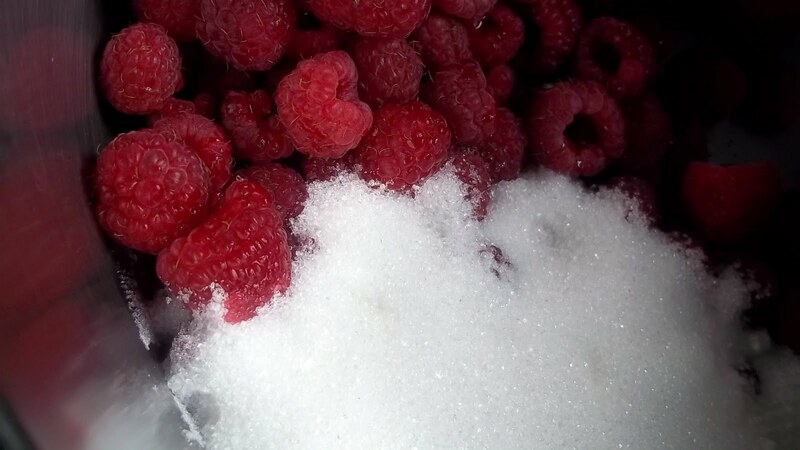 Dump frozen raspberries and sugar into a sauce pan. Over medium heat, stir occasionally for 20 minutes or so til all the sugar has dissolved. 2. 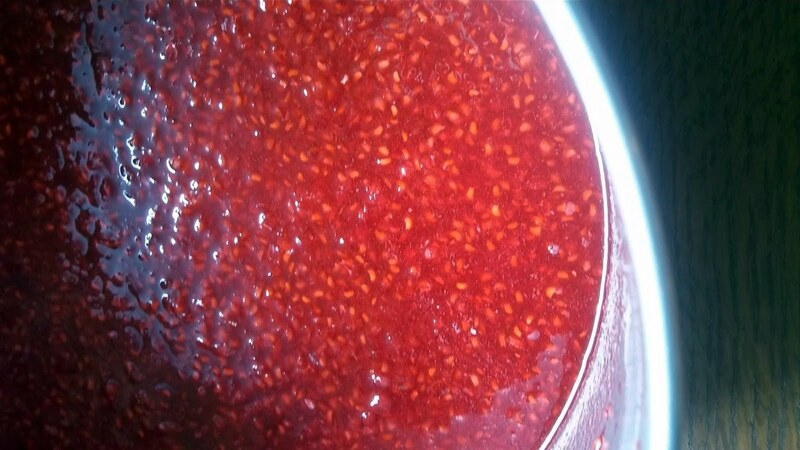 With a potato masher (or whisk or egg beater) bash raspberries about til you break them up and get all the juice out. 3. Use a mesh sieve to strain out the juice. You can throw out the pulp or save it and for smoothies because you’re healthy and clever. 4. Squeeze the juice of two of the lemons into the now pulp-free raspberry juice. 5. Boil the four cups of water and add it to the raspberry/lemon juice. 6. Chill the juice and right before you serve it, float a thin slice of lemon on top. This drink is awfully nice – and if you’ve got an ice cream machine, I’m sure it would make a lovely sorbet! What are your favorite foods from stories you’ve read? We’ve got recipes coming up from Little House on The Prairie and Harry Potter! this is SUCH a great idea! i look forward to the upcoming meetings of the literary nibble club! I can't wait for more literary nibbles! Looks delicious! I'll definitely be trying this one out. Some of the book's recipes have showed up on the author's blog (and/or the recipes area). One of my favorites: Butter bombs. Ack. I'm hungry just typing this. I'm obsessed with this idea! I LOVE books, I LOVE food and I LOVE to read your blog. I love this so much. I'm a huge Anne fan (fAnne?). I even dragged the poor Mr. up to Prince Edward Island a few years ago just so I could go see Green Gables! Thanks, Sarah! Oh Sarah, this made my morning. I can't tell you how many friendships I've cemented over my love of Anne. You and I are kindred spirits! Can't wait to see the other recipes you have coming. Anne of Green Gables was one of my favorite books as a kid and I distinctly remember the first time I ever understood why Diane got sick from the raspberry cordial, which was something that had mystified me when I was younger. It was a definite "I'm a grown-up" moment. Jessica beat me to it saying, in most dramatic Anne fashion, we are kindred spirits! I've been trying to sell my husband on naming our some-day child Anne if we have a girl. He's not having it, sadly. Ummm – suddenly feel the need to call my bosom friend….thanks for this. Just.love.it. Kaitlin, I was actually supposed to be named Anne but my cousin (Yes, I'm looking at you, Ann Riddle!) was born first and 'stole' my name! The.nerve. Love this! Ever read fried green tomatoes? Ha! My sister-in-law made it quite clear (before I was even engaged to her brother) that I was NOT to steal her chosen baby names. What a fun idea! Looking forward to more posts like this! love it, love it, love it. Wait, did I mention that I freaking love this? Oh, I love love Anne of green gables. I read the whole series and saw the movies! I need to do a reread of the books soon. This post made me so happy! My friend Kate and I have always talked about making a play list from songs mentioned in books. same basic idea. I make a drink similar to this but substitute blueberries for raspberries and substitute black tea for water. 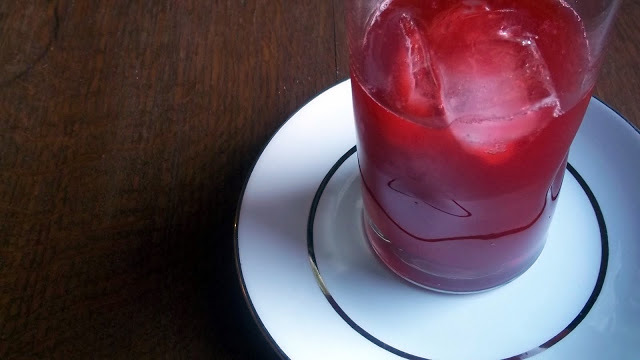 Makes the most delicious blueberry iced tea/summer drink you've ever ever had. Anne of Green Gables is such a special book (and series!) Such a special part of so many childhoods (and adulthoods), and a lovely slice of Canadiana. I like to think that Marilla would have been mortified about the cordial incident, but also secretly amused! This is a wonderful new feature!! Great work, Sarah! This made me think about books I love and whether there was any food in them. The only thing that came to mind was a wonderful description of a feast in Eugene Onegin by Pushkin. Sadly it doesn't translate nearly as well into English. WANT. NOW! i actually just got a redwall cookbook by brian jacques and made a redwall feast for my (now ex) manfriend. he was completely impressed and it was kind of a bit devilish how delicious everything was! i love this idea. I've seen the movie, like, at LEAST 15 times. That totally counts as reading the book once, right? A coworker participate sin a book club and they theme the food at their meetings after the books they read. I always think this sounds fun, but my book club is full of people with small children, so I'm not sure anyone but me as the time to do it. Have you read the Guernsey Literary and Potato Peel Pie Society? That would be a good item to make. Also, when The Help movie came out, they produced a book club kit with food and drink recipes. Chocolate pie anyone?